in Northern Wisconsin, half of our 80-acre hobby farm is wild Tamarack swamp, popple forest, and wetlands containing a meandering creek shared with abundant wildlife. 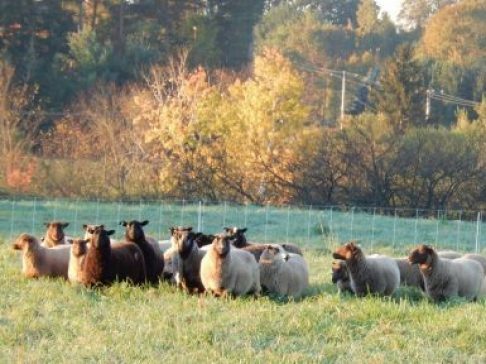 We live, work, garden, grow crops and hay, and pasture our flock of NASSA and FFSSA registered Shetland Sheep on the other half. are fine-fleeced Traditional 1927® Shetland Sheep breeding stock or fiber pets and their wool in various natural colors and hand-dyed. 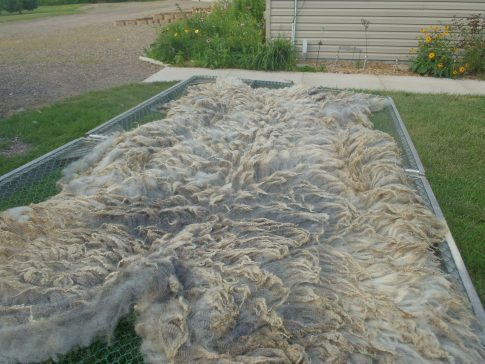 We offer fine, low-scratch or scratch-free raw wool fleeces, processed wool rovings, top, felting batts, fine handspun and millspun yarns, washable pelts, various handmade items, and on a seasonal basis, direct-marketed, healthy, grass-finished lamb. As Senior Members of Fine Fleece Shetland Sheep Association (FFSSA) at http://www.finefleeceshetlandsheep.org/, we are required to micron test midside wool samples annually from each sheep in our flock . 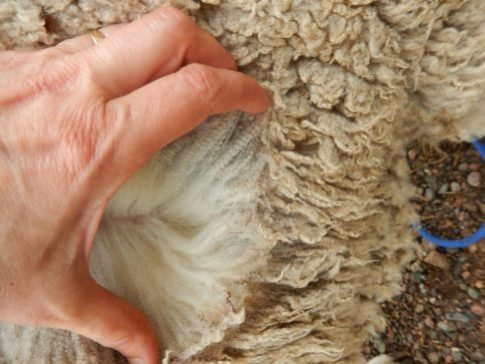 Qualifying sheep and wool carry FFSSA’s US Patent, Traditional 1927® Shetland Sheep and Wool Products, assuring buyers of quality breeding stock and wool. We have owned Shetland Sheep since 2007, but in June, 2011, we both retired from our careers in health care (Russ) and environmental biology (Jeanne, aka Terry) and brought a small flock of 6 NASSA-registered Shetlands from Southeast Minnesota to a farm we purchased in Northern Wisconsin near the family farm where Russ grew up. Here we raise fine-fleeced Shetlands in a conservation-friendly way and our flock has grown to 25 in winter and mid-40’s in summer. We are Senior members of the North American Shetland Sheep Breeders’ Association (NASSA) http://www.shetland-sheep.org/ and Senior Members the Fine Fleece Shetland Sheep Association (FFSSA) http://www.finefleeceshetlandsheep.org/. 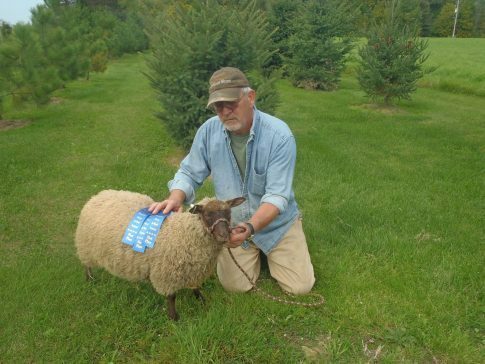 We are also members of the Midwest Shetland Sheep Breeders Association (MSSBA) and the Wisconsin Sheep Breeders Cooperative http://www.wisbc.com/. Terry belongs to multiple regional fiber guilds and arts organizations. She knits, crochets, felts, hand-spins with wheels and spindles, and hand-processes some of our wool . We sell the rest to quality-conscious hand-spinners and knitters. Because we both earned B.S. degrees related to human health we are interested in animal health, too. Terry worked as a Clinical Microbiologist and also in other types of medical labs early in her career, and Russ worked as a Clinical Chemist for the first half of his career. We have included information-rich links and websites related to sheep health on the “Resources” page on this website–we hope you will find something useful. Since the largest portion of Terry’s career was in Environmental Biology, she is also interested in Conservation grazing. In Europe, the U.S. and the British Isles, Shetlands excel at conservation-related grazing due to their relative portability (small size, biddable dispositions) and willingness to either browse like goats or graze like sheep. How did we first learn about Shetland Sheep? By chance–Terry sat with a woman on a flight to Dallas because they were both knitting–the new friend her own handspun yarn and Terry the usual commerical yarn. Terry shared a life goal of hers to raise sheep and learn to spin, and that we had just bought farmland and wild land to retire on. She learned on this flight that Shetland Sheep are a favorite breed of hand-spinners and her new knitting friend helped her connect with a spinner and flock owner near where we lived at the time. Some things are just meant to be. is to produce healthy, high quality, NASSA and FFSSA-registered, single-coated US patented and FFSSA compliant Traditional 1927 ® Shetland Sheep and Wool Products in conservation-friendly way in harmony with native plants and animals.